HUDSON, MA--(Marketwire - March 8, 2011) - Anver Corporation is introducing a line of simple to operate and highly reliable air amplifiers and vacuum transfer tubes that have no moving parts, cannot overheat, and feature a straight-thru interior for conveying powders, pellets, textile scraps, wood chips, and non-caustic fumes without clogging. 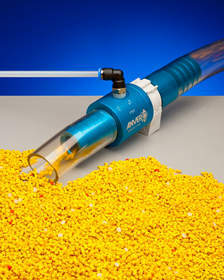 Anver TT Series Transfer Tubes are powered by compressed air and employ the Venturi principle to create a powerful vacuum for conveying and evacuating light materials such as powders, pellets, wood chips, and non-caustic fumes. Providing infinitely adjustable transfer speeds, the materials pass directly through the smooth, straight-thru bores of these vacuum transfer tubes with no possibility of clogging. Suitable for a variety of applications, these pneumatic Anver TT Series Transfer Tubes will not overheat which makes them explosion proof and their flow rates can be infinitely controlled from 15 to 95 SCFM respectively, by regulating input air pressure. Available in bore sizes from 0.375" to 1.0" I.D., these vacuum transfer tubes have no gaskets or O-rings and can be supplied with optional mounting clips. Anver TT Series Transfer Tubes are priced from $49.99 each, depending upon size and quantity. Complete vacuum transfer tube specifications are available. Anver TT Series Transfer Tubes are powered by compressed air and employ the Venturi principle to create a powerful vacuum. They have a smooth, straight-thru bore which lets light materials such as powders, pellets, and wood chips pass through without the possibility of clogging.